This post is sponsored by Little Tikes. We love to celebrate the arrival of Spring each year by hosting a party with friends! We love to do flower themed crafts and activities and use our imaginations! This year we are excited to partner with Little Tikes to share how we are getting our imaginations in motion this Spring! Don't miss out on the awesome giveaway we are sharing today too. Scroll down for more details. 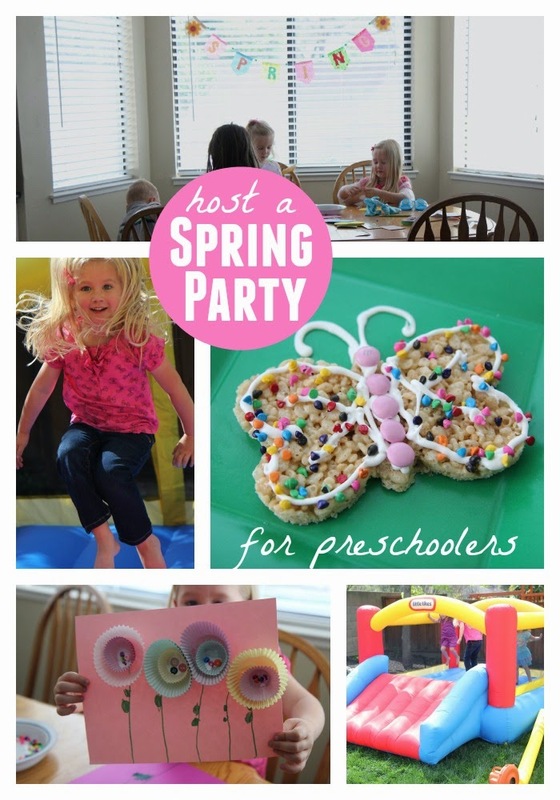 I host a lot of parties for toddlers and preschoolers and I like to keep them fun, filled with creativity, and active! 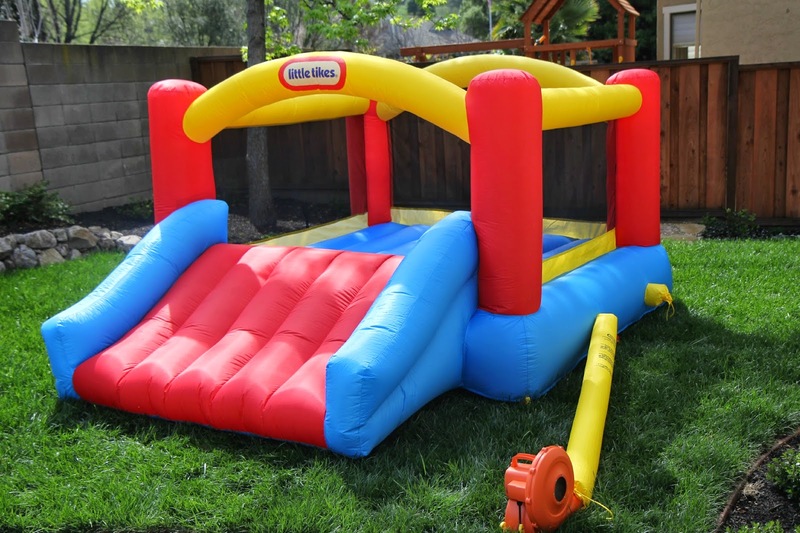 We were recently sent a Little Tikes Jump 'N Slide Inflatable Bouncer to add to our party! While our Little Tikes Jump 'N Slide Inflatable Bouncer was blowing up we started off the party by getting our imaginations and fingers moving making a muffin tin liner garden craft! Materials needed: white glue, muffin tin liners (in a variety of colors and sizes), sequins, buttons, beads, cardstock, markers, and any other embellishments. First we drew stems using markers and then we glued on our muffin tin liners. We used two different sizes of muffin tin liners to add more dimension to our flowers. Once we glued on the muffin tin liners then we added embellishments using glue. It was fun to see how each child made completely different flowers using different color combinations and embellishments. If you turn the muffin tin liners inside out they can add extra color to your picture. Squeezing glue and picking up tiny materials like sequins and buttons is a great way to strengthen fine motor skills and build strength in little finger muscles! After we completed our muffin tin liner garden crafts using our finger muscles it was time to work out our leg muscles in our bounce house! Not only did the kiddos bounce and slide, but they were also really focused on our Spring theme and were leaping around like butterflies and other favorite insects while in the bounce house! I love including bounce house play during parties because bounce houses are such a great way to get kids active and moving! 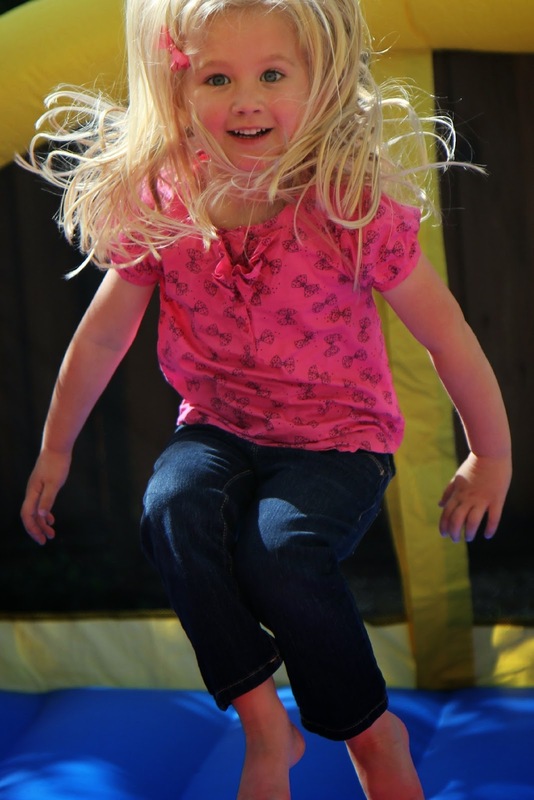 Preschoolers are at the perfect age for a bounce house because most preschoolers have a lot of energy and are also capable of jumping, hopping, sliding, and climbing! Turning on some music for bouncing and dancing is also an awesome way to get kids moving! 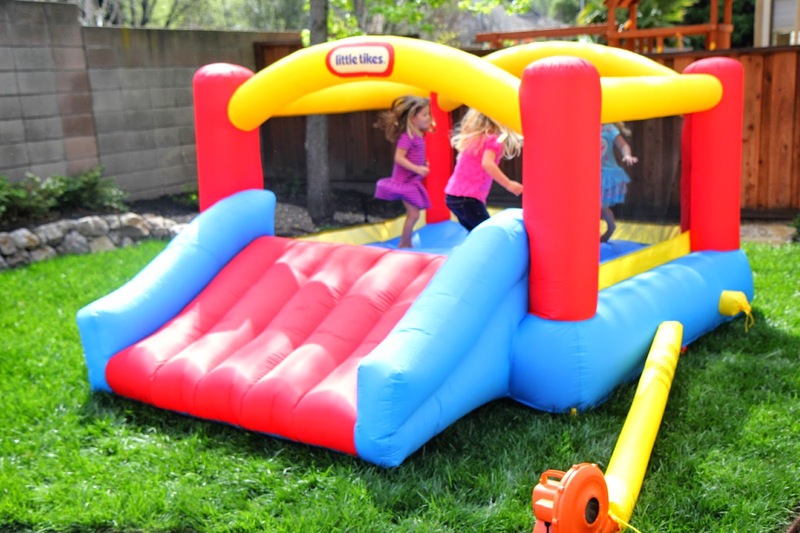 The Little Tikes Jump 'N Slide Inflatable Bouncer is for kids ages 3-8 and is perfect for family celebrations or small celebrations with friends. We usually invite two to three friends over for our preschool playdates and celebrations so our bouncer is just the right size. I always love listening to the giggles and shrieks and seeing big smiles as the kids have so much fun together! After our bounce time the kids were exhausted and hungry! I gave them a snack and then we decorated a little Spring rice crispy treat. The kids got to decorate either a flower or a butterfly rice crispy treat. Since I didn't have a butterfly cookie cutter I used a heart shape cookie cutter to cut out two hearts and then I squished them together and added a butterfly body before I gave them to the kids. bag of mini marshmallows, rice crispies (6 cups), 4 tablespoons of butter, sprinkles, Spring M&Ms, frosting, large pot, baking sheet, and any other treats you want. We used Cadbury mini eggs. To make the rice crispy treats just melt the 4 tablespoons of butter on low in a large pot on the stove. Once it is completely melted, add the marshmallows. Mix on low until the marshmallows are completely melted and mixed with the butter. Next remove the pot from the stove and and add in six cups of rice crispies and mix until the marshmallow is combined with the crispies. Lastly, grease a large baking sheet and spread out the rice crispy mixture onto the large cookie sheet until you have a pan filled with rice crispies around 1 inch thick. Use cookie cutters to cut out shapes to make your Spring rice crispies. We used flower cookie cutters and heart cookie cutters (to make butterflies). You could also make ovals and decorate rice crispy Easter eggs. To decorate our rice cripsy treats I drew on the flowers and butterflies with white frosting and then the kids decorated their treats with sprinkles and other favorite candies. My daughter's favorite treat was the butterfly rice crispy treat because she thought it was so fun to make the M&M butterfly body. I added the frosting antennae for her when she was done! 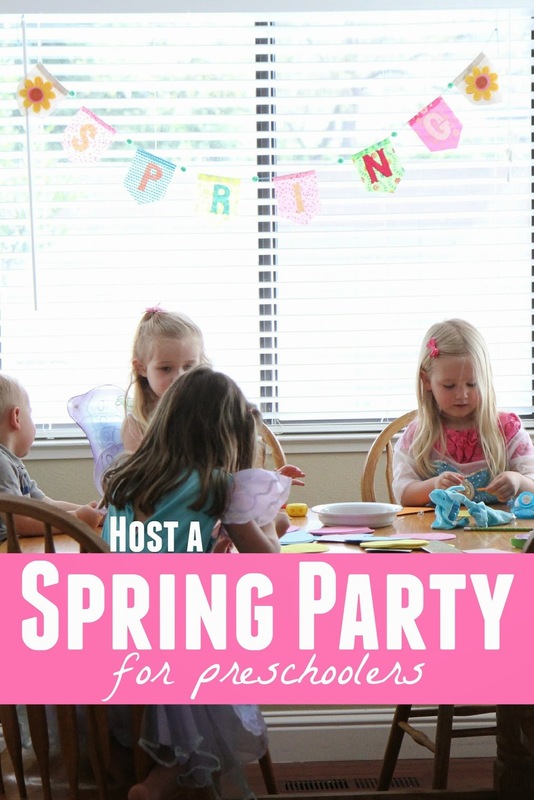 Do you want to host your own Spring Party or do something else fun with your friends and family to celebrate the arrival of Spring? 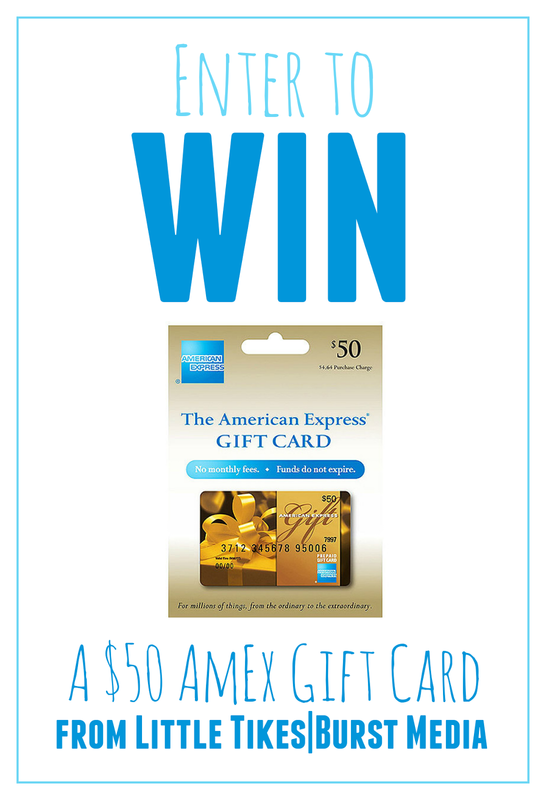 We are partnering with Little Tikes to give away a $50 American Express gift card to one Toddler Approved reader! You can get up to five entries by completing all tasks mentioned in the rafflecopter form below. The winning entry will be drawn on Tuesday, April 7th. I will notify the winner via email. To keep updated on news from Little Tikes you can follow them on Facebook, Twitter, Pinterest, and Instagram. This is a sponsored conversation written by me on behalf of Little Tikes l Burst Media. The opinions and text are all mine.